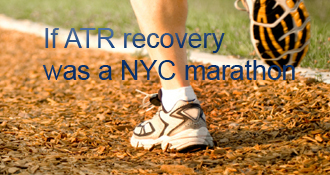 treetopflyer has completed the grueling 26.2 ATR miles to full recovery! Goal: 365 days from the surgery date. I’ve been slowly getting back to the gym being super careful not to “tweek” my foot. I’ve been doing light back squats, semi light dead lifts, American kettle bell swings, rowing, aryodine bike. These excercises on top of my nightly ankle excercises to stretch. I’ve been trying to jog but the front of my ankle has slight pain, I’m assuming it’s just another hurdle but am wondering if anyone else has this experience? Heel pain is mostly gone unless I really push it but for the most part is gone. My concern is jogging on an ankle that feels like bone on bone (I’m sure it’s not) and causing damage before muscle or tendon strength is built up in that area. Any suggestions?? I firmly believe people make their own choices based on many things. Doctors advice or the advice of others. I have been around here for quite a while and have seen the various choices people make. A friend of mine started surfing at 12 weeks after his ATR and ended up back in surgery. That was his choice. I have read here of many re-ruptures up to and past 12 weeks. Some have been from people pushing too hard too soon. I have also read of others doing what would seem amazing things at an early stage. If the need to run outstrips your risk of re-rupture then again I say that is your choice and the consequences good or bad are yours to endure. Support here comes regardless. The important thing is a full recovery which takes a year or so. Tree - Everyone is different, and I have no idea what condition your ATR is in, but I hit 12 weeks a few days ago and I’ve been running on a treadmill since about week 8. I’ve been playing ice hockey since week 7. The ice hockey was possible because of the limited ROM in the skate. My running began as a “few minutes” at a time and I’m now up to about 2 miles on the treadmill. I’m going to start road running this week (Week 13). I’m not mentioning this to draw comparisons, only to let you know that it is possible without pain. My PT and Dr. basically said “do what feels okay, without pain”. So, simply, “If it hurts, stop!” This has really allowed me to push my PT agenda. I have been doing box jumps for weeks (12″ to 18″), squats, calf raises, stairs, etc. Push yourself but be smart about it and I think you’ll be okay! Stuart, the list of excercises the Doc gave me at the 8 week mark were exactly that. The stair heel drops/raises have been a daily exercise at least for the last week to 10 days. I’m a little freaked out because the Doc said no PT just go back to the gym and slowly get back at it which I have been doing. I’m walking up the stairs on the balls of my feet. I’ve been clipping into my mtb bike and road riding. I’ve been back squatting with a light load. Sounds like I need to make a call to the Doc Monday and recap our conversation. I definitely do NOT want to go down this road again. Thanks for the heads up I appreciate it. Just to add to what Donna has said - Bent knee works the soleous and straight the gastroc. I confirm as well the going down slowly is more important than pushing up on your toes. Regarding running. I too think it is a bit early to put that much stress on a tendon that is not completely healed and there is still a considerable risk of re-rupture. If you feel you need the workout then I would suggest starting with hills and stairs. As your tendon and muscles get stronger you can move the position you plant your feet on the stairs back so less of the foot engages the stair. Please be careful. This is still early days of a long recovery and I would encourage you to look to the end game. Absolutely an awesome information packed response. Thank you! Best of luck on your recovery! Hey there…as always take what is helpful and leave the rest…smiling. Getting to the gym at 10 weeks, good for you! Being in the gym those first few times I got back at about 12 weeks was big SCARY!… however,I think the rowing is questionable at 10 weeks, I’m thinking it may be too much of a plantar flexion stretch, but that’s my opinion. My PT said no rowing until 16 weeks. You could do a search in the box top right main page and put in rowing to see what other bloggers say about it, same with running. I don’t think running is advised so early, and I’m willing to be totally wrong on that one!…I’m sure I’ve read stories of people running as early as 10 weeks…hopefully a early runner will show up with some tips for you. My basic feeling up until 16 weeks when the rate of re-rupture drops significantly I’m not doing anything that is high impact such as running or jumping. Funny you ask…I was just sitting here massaging the incision area and I thought to myself “man this is warm”. So yes it is haha. No redness here either just slightly swollen and warm. Friday will be 8 weeks for me. Have you noticed warmth in your heel/ankle area? I have no redness, just very warm to the touch in the whole area. You seem to be doing very well! Keep up the good work! treetopflyer’s AchillesBlog is proudly powered by WordPress and WPDesigner..